With Apple's iCloud share, it is now possible to plan your wedding with other people. This can be anyone including your fiancé, bridal party or immediate family and friends. NOTE: iCloud Sharing is only compatible with devices running iOS 10 or above, Mac OS X 10.12 or above. 3. Tap on Manage Shared and invite the people you would like to share your wedding plans with. Please note: Choose one person (for ease of reference, for example, will be named Person A) in the group to invite and manage who to share the plans with. Anyone with the shared link can make changes to your wedding plans. Please note that the link you share for Wedding Planner PRO needs to be accessible on the person's device and the device needs to be connected to Internet. 2. 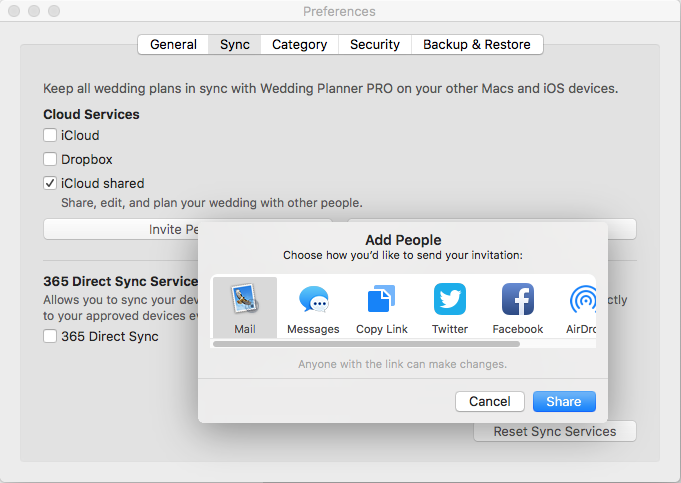 Launch the app, and you will see the following initial option to sync or create a new wedding (please see screenshot below). 3. As you are considered a 'new user' at this stage, simply select ‘No, I would like to create a New Wedding.’ The application will launch and this is now what you will see (please see the screenshot below). IMPORTANT: At this stage, DO NOT enter any of the wedding details nor press done. 4. Just minimise the application by pressing the ‘Home’ button on the device. 5. Then, go back to the link that was sent to you. Tap on the link and and it will either ask you if you wish to open the app, press ‘Open’. 7. Click Join and let the device sync with your wedding plans. As it is syncing for the first time, and depending on how many images or files Person A has on their wedding database, it may take some time to sync. Your patience will be greatly appreciated!